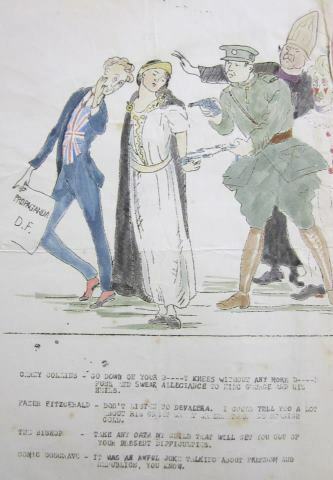 An anti-Treaty cartoon from 1922 depicts Michael Collins backed by Britain. The Civil War is discussed in episode 11. This is the second part of our archive of Near FM’s History Show, presented by Cathal Brennan and John Dorney. The first part is here. Topics range from the 1913 Lockout to Ireland’s ‘History Wars’ to Irish women and the First World War. Hopefully there will be something of interest to all. This episode talks about he 1913 Lockout. We are joined by Padraig Yeates to discuss the most famous labour dispute in Irish history. In the first part of the show, Alex O’Fhailghigh talks about radicalism in the Irish community in Scotland. In the second part of the show, Pádraig Lenihan talks about the historiography of early – modern Ireland. On this episode we talk to Dr. Conor McCabe of the UCD School of Social Justice about the southern Irish economy since partition. In this episode we are joined by Aidan Beatty, a PhD student from the University of Chicago to talk about his research on the links between Irish nationalism and Zionism. On today’s episode we’re joined by Dr. Brian Hanley of University College Dublin. In the first half of the show, John interviews Brian about the IRA during the Emergency (World War II). In the second half of the show John and Brian discuss the effect of the Troubles in Northern Ireland on southern society. The Irish Revolution as a backdrop for historical fiction. On this episode of the History Show, Cathal Brennan and John Dorney talk to Irish – American novelist Kevin McCarthy about his novel Peeler and using the Irish Revolution as a back drop to his novels. Written by: Cathal Brennan on 31 May, 2013. Last revised by: John_Dorney4 June, 2013. One Response to "The History Show Archive Part II: Episodes 8-16"